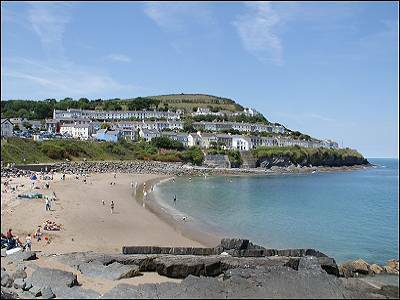 Teifi 18 holiday caravan at Quay West, New Quay, Wales. 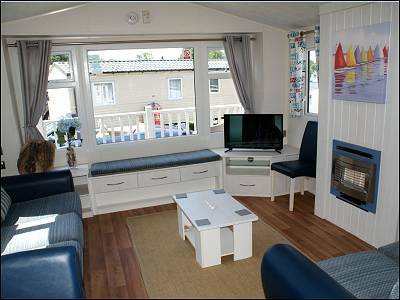 This centrally heated and double glazed 3 bedroom Willerby Isis Caravan is located in a quiet section of the park, with sea views and woodland to the rear and with a new large wrap around extra wide timber deck with table and seating plus a barbecue. 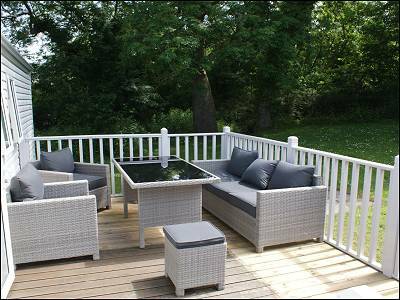 The deck is fully gated and enclosed and ideal for children and pets. Two well behaved dogs are welcomed. Short breaks may be available in the autumn by arrangement. 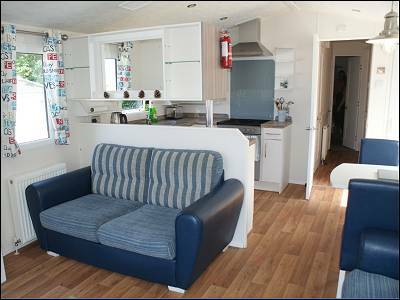 Accommodation - The comfortable lounge has free standing sofas and includes a sofa bed for extra accommodation, 32 inch LCD TV and a wall mounted heater. The dining table seats 5 plus extra chairs available. There is a well equipped kitchen with full sized gas range cooker and oven with grill. 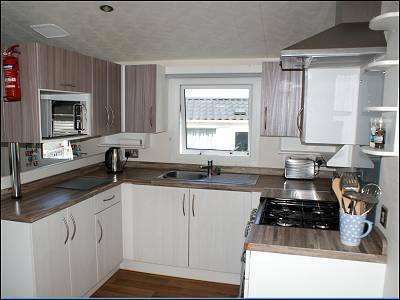 microwave, integrated fridge with 3 drawer freezer below, as well as all the usual small appliances, crockery, cutlery, glasses and kitchen ware. The owner provides essential cleaning supplies. 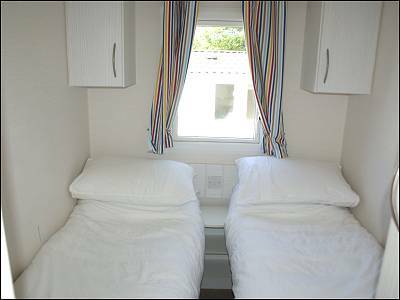 The double bedroom has a flat screen TV and an en-suite Jack and Jill shower room with WC and basin next to one of the twin rooms. There are two twin bedrooms . Duvets and pillows are provided, including the sofa bed., guests may make arrangements with the owner for bed linen to be provided and beds made up for arrival. There is also a separate WC and basin. There are radiators throughout the caravan. Bed linen, towels and bath mat can be provided by the cleaning company for £12 for a double bed , and £8 for a single bed - arrangements to be made with the owner after booking. 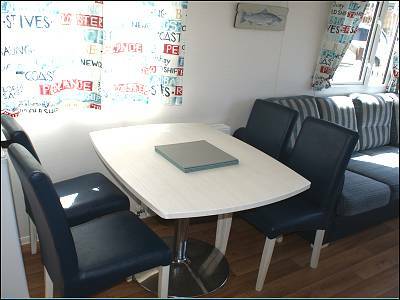 The caravan and deck is accessed from the parking area by 2 steps. 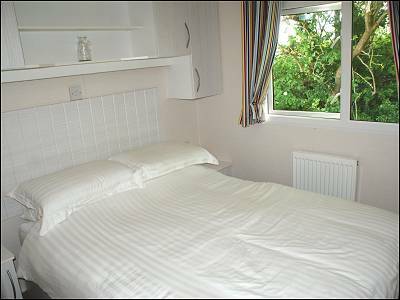 Duvets and pillows provided , bed linen can be hired by arrangement with the owner. Off-road parking for one car plus overflow parking nearby. 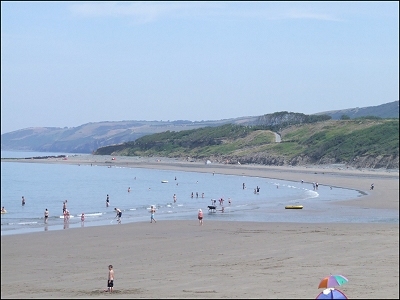 Quay West Holiday Park provides direct beach access to Traethgwyn Beach - see photos above - a wide sandy beach that you can walk along all the way to New Quay at Low / medium tide. The Main Park Complex provides entertainment every day until late and hosts a string of Top Shows, Cabarets and Live Music. In addition you will find a Heated Indoor Pool, Amusement Arcade, Aqua Bar, and Pool Tables & Bowling Alley. 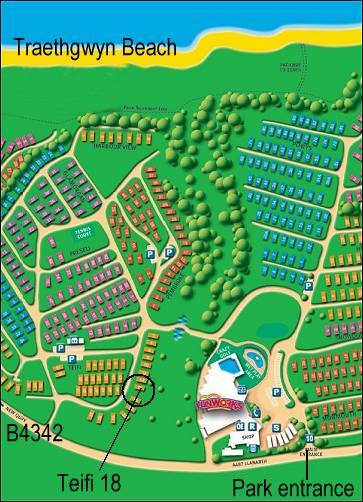 Please note our prices do not include entertainment passes which can be obtained from the park direct after your arrival. 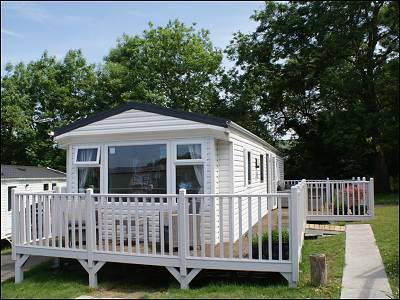 Quay West Holiday Park is a family holiday park and we cannot accept bookings from all male or all female parties or groups under 25 years of age.